Have I mentioned how much I want a garage? So far this week we’ve started the days with heavy frost that took forever to scrape off the windshield and freezing rain that coated everything in ice. More rain is forecast this week, which means I will get wet coming and going from my car to the house. Sarah in Illinois recently built a garage with a bit of help from family. She is here today to share the process and an extra special feature that makes it even more useful. About a year ago, on a Friday night, Steve and I were laying underneath my SUV in our freezing cold garage. A few days earlier my transmission had went out, and since Steve has some experience as a mechanic and has no fear of tearing things apart and putting them back together, we decided to save some money by removing it and reinstalling a used transmission by ourselves. Except things weren’t going well. We were tired, sore, cold and frustrated. I drew the line when I laid my head down in a puddle of transmission fluid. 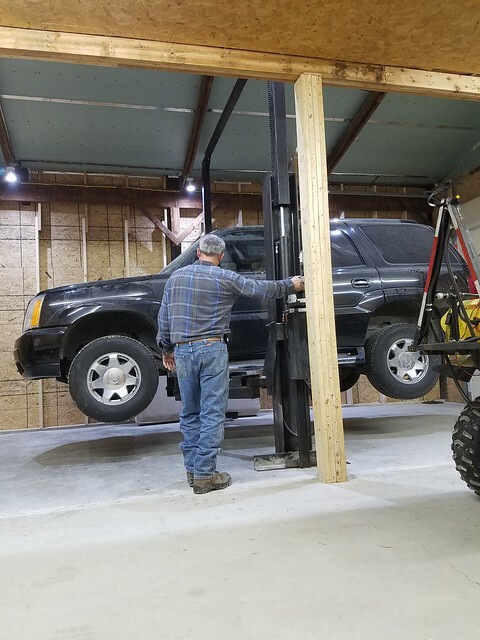 Steve and I looked at each other, and he said, “I will own a car lift.” At the time I agreed but knew that lifts were really expensive, and we really didn’t have a good place to install one. A couple months went by and a customer ordered a new car lift from the shop where I work. It is not often that we sell one, and I got to talking to him about his old lift. He said that it still worked. It just wasn’t working for him anymore. I grabbed my phone and called Steve and gave him the customer’s phone number. Two days later we owned a used car lift. Now for the important part. Where the heck were we going to put it? We have a large pole barn on our property, but it has a dirt and gravel floor. In one corner the previous owner had built a woodshop with a small concrete pad. 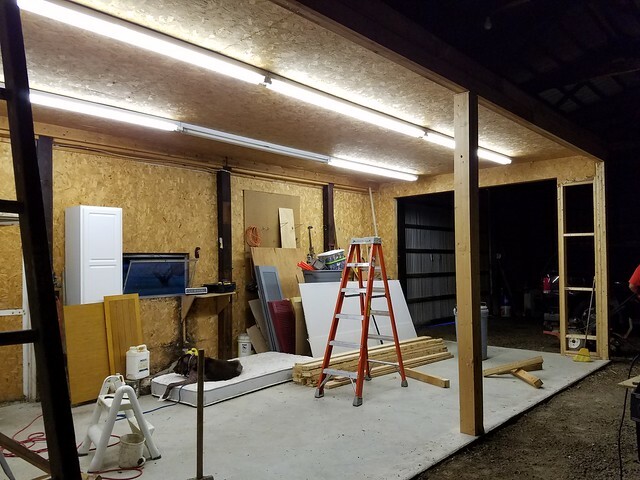 We decided to extend this pad and basically make a garage inside a small part of the pole barn. 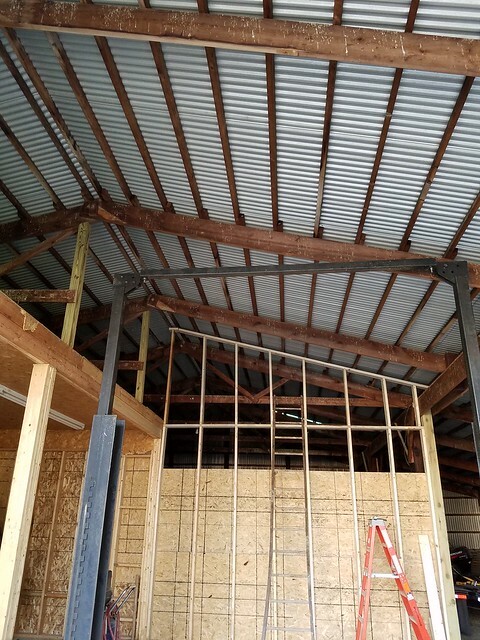 This picture is showing the woodshop inside the pole barn with two walls removed. For several weeks we spent evenings and weekends tearing out two of the old walls of the woodshop and framing up for a concrete pad. 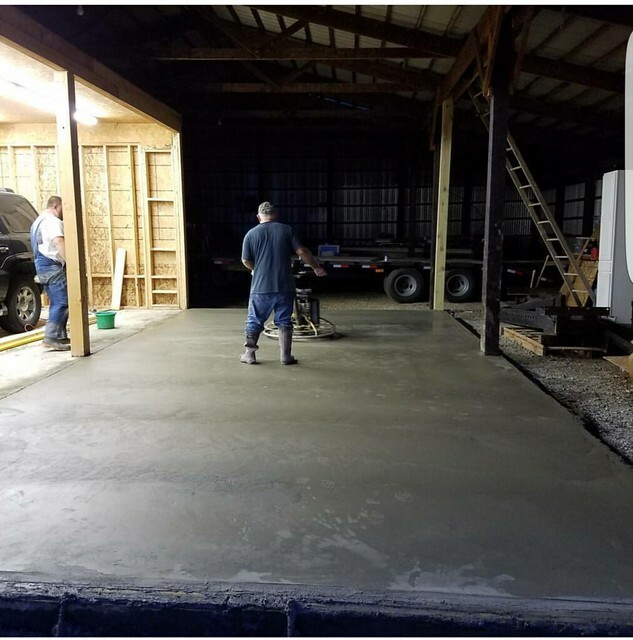 When we had the framing ready Steve, my Dad and brother took a day off work and poured and finished the pad. I am so thankful that my family is so helpful and knowledgeable with projects like that. They ended up saving us quite a bit of money. Once the pad was cured, it was time to build the new walls. We borrowed some scaffolding to help with the new tall walls and to install some insulation board on the ceiling. Steve and I believe that having good insulation is very important in any building project. 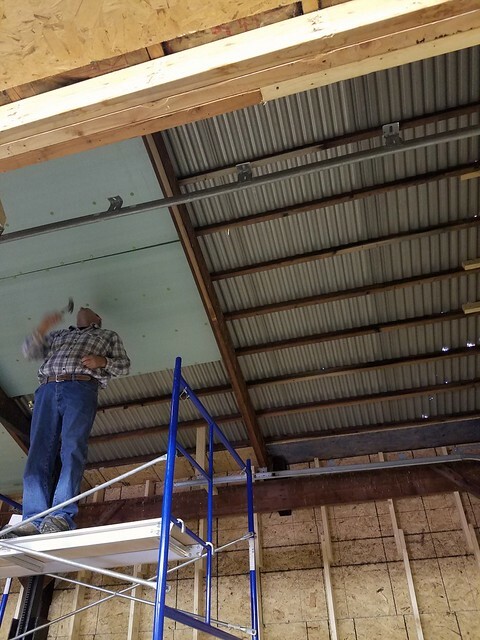 What we have chosen to put on the ceiling is not ideal, but we have limited options with a tin roof. We seriously considered spray-on foam insulation, and honestly it’s probably what we should have done. But right now we are settling with what we have. To install the vertical supports of the lift, Steve and my dad used concrete anchor bolts. They drilled holes using a hammer drill then inserted the sleeve and bolt into the hole. When the bolt was tightened it expanded to hold tight to the concrete. 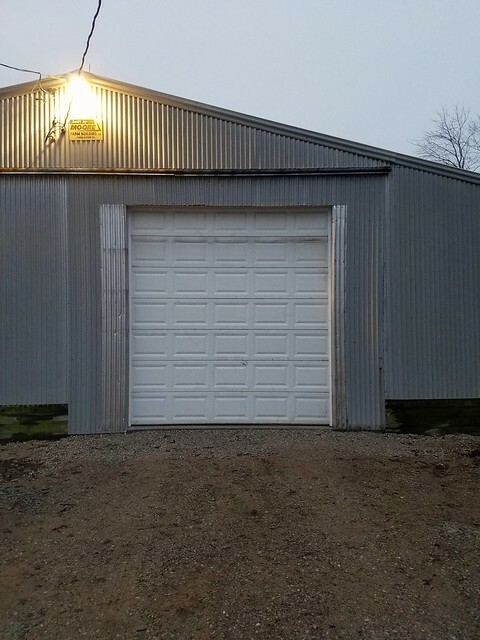 One of the final steps was to install an overhead door. 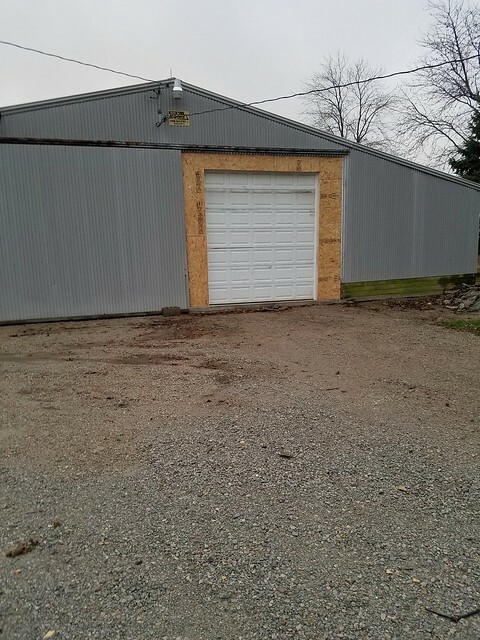 The pole barn has huge sliding doors on two sides, but this wasn’t handy for the new garage. So once again family came in very useful. My dad is known for not throwing things away in case he needs it someday. Well, it worked out for us. He had all of the parts and pieces for an overhead door. We had to frame in a smaller opening, and then Steve, my Dad and my stepson took some of the tin off of the sliding door and covered the new smaller opening. This week Steve has been insulating the walls. We still want to add another overhead door and of course he has to fill it with all of his tools and supplies. But basically we are going to call this project done. And I have one happy hubby! Great job, Sarah and family. I love that you did this all yourselves. Your family sounds very helpful and very handy. How great that your Dad had the door already! It looks like a great space for you and Steve. That lift is pretty cool. There needs to be a “mind blown” emoji! That is incredible. Imagine having that much know-how and helpful people at the ready to make something like that. 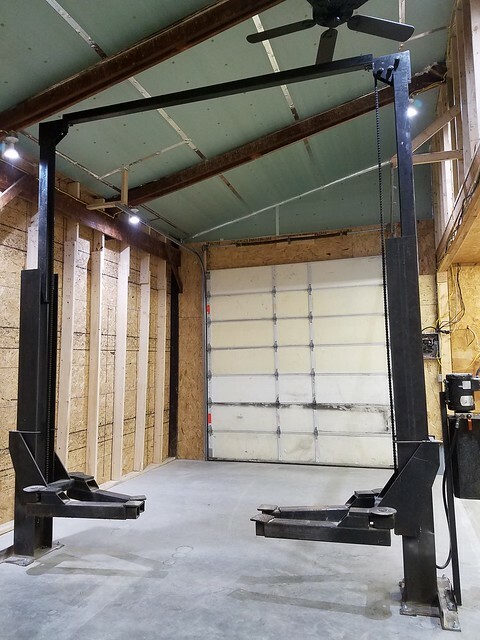 What an awesome addition the garage and lift will be for your farm! Haha! We are pretty proud of the project and Steve is the envy of several friends and family. He spends several nights a week out there “piddling”, rearranging and just living it up. I am so happy that we were able to do this for him, he does so much for me!